This is a beginner-friendly step-by-step tutorial where we will put all the pieces of Machine Learning process together, and complete an end-to-end Machine Learning project. Our task will be to create a model capable of determining which of the three species a flower belongs to based on it's description. It is a classic Machine Learning challenge that's perfect for beginners. Iris Flowers Dataset is a small, well-researched dataset that consists of 4 features describing each flower(length and width of it's Sepal and Petal), and the flower's species(one of three - Iris Setosa, Iris Versicolor, or Iris Virginica). As a result we will have a complete model capable of making accurate predictions. Let's get started! Jupyter Lab - an interactive environment Machine Learning researchers use for their projects. Pandas - a data analysis library (kind of like Excel in Python). Numpy - a library for dealing with all sorts of mathy stuff, specifically arrays and matrices. Matplotlib - a powerful plotting library. 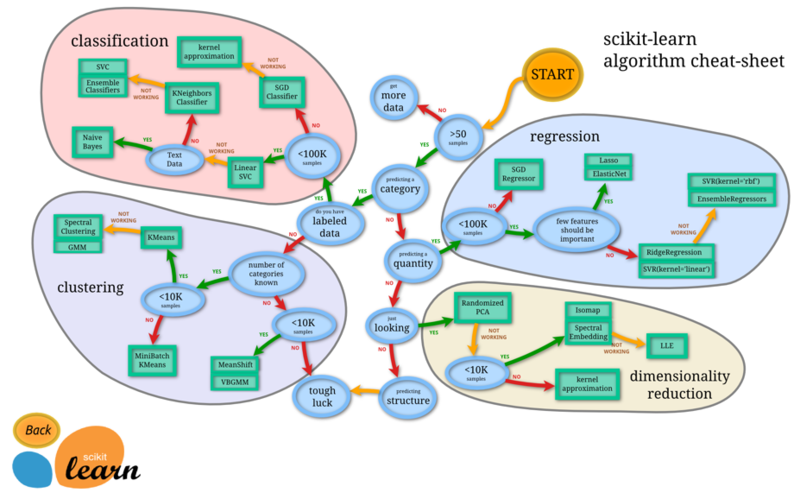 Scikit-learn - a powerful Machine Learning library making it easy to train and analyze all sorts of ML algorithms. The easiest way to make sure you have all of this properly installed and set up is to download and install Anaconda - a popular Python Data Science platform that comes with all the necessary tools and makes it very easy to install new ones. If you have not received any errors that means your setup is ready, everything is installed, and you're ready to go! # Load the data, use the first column as index. Excellent! Data is loaded successfully, and data.head(5) is a Pandas function that shows the first 5 rows of the dataset. As you can see, it contains Sepal/Petal lengths and widths of many flowers, and their corresponding species. Let's analyze the dataset to see what else we can learn just by looking at the data! As you can see, it contains the 5 columns (4 for features describing the flower measurments, and 1 for labels describing it's species). Also we can see that all features have the same number of values (150), that means that none of the data is missing. Great! 25%,50%, and 75% rows show the corresponding percentiles. A percentile shows the value below which a given percentage of observations falls. For example, 25% sepal lengths are smaller than 5.1cm, 50% are smaller than 5.8cm and 75% are smaller than 6.4cm. Now let's look at so called "class distribution" - how many flowers of each species are there? Looks like we have 50 flowers of each species. Box plots conveniently summarize the distribution of each variable. The line in the middle of the box represents the median value(data point that's in the middle), and box around it shows 25th and 75th percentiles(middle 50% of the data). "Whiskers" show the rest of the distribution, and points outside of them show the outliers. We have colored all the datapoints according to their species, and we can see that similarly colored points are grouped together into little clusters - that's great news, because it means that our algorithms are likely to be able to easily separate them. To avoid comparing each variable to itself(which would be pointless, the main diagonal would be full of straight lines), diagonal shows the histogram of each variable. Excellent, so that's that for our data analysis! It's time to select and train a few algorithms! When you need help deciding what algorithms to try for your problem, consult this guide. We have evaluated each model using so called K-Fold cross-validation. Basically it splits our data into several (five in our case) parts (called "folds"), and trains an algorithm 5 times setting aside each one of them in turn, and training it on the rest. This allows us to train our algorithm on all the available data, without wasting the chunk we've set aside for testing. Besides, if our randomly selected data is skewed in some way, this process makes up for that. As a result, we have a mean (average) accuracy score, and it's standard deviation (how much it is spread out, how noisy it is). Looks like Linear Discriminant Analysis and SVM models created the best results in our case. 97% accuracy - not bad! Now it's time for our final test - checking the accuracy of our model on our validation set. This will let us know how our algorithm will perform on real data it has never seen before. Wow, that's fantastic! Our model has performed with 98% accuracy. The diagonal values show us how many values were classified correctly, the other ones show us which instances were misclassified. In our case, only one flower of Iris Virginica species was mistakenly classified as Iris Versicolor. That's it! You have completed your first Machine Learning project with pretty impressive results! I hope this tutorial was useful to you, subscribe to my blog for more posts like this, and check out the other articles I have written!